This morning, after Sean and I opened presents and ate a WONDERFUL Christmas breakfast, I pulled my scope over to the window to look for the MCC falcons. I see two adult birds almost every day, except when it is snowing. This late morning was no exception. 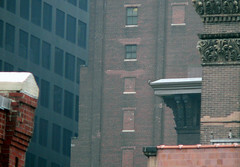 One bird perched atop the Monadnock building. With my scope, I could see that the bird’s bands were black and red, but of course, from this distance, I couldn’t read them. I assume that is Hercules, but I can’t be sure without reading her bands. 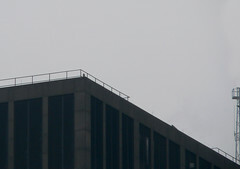 Way up high on the railing of the EPA roof, I saw another bird. I couldn’t see anything of the bands, but I’ll bet money that’s Max. It was a lovely thing to see on Christmas morning! ~ by Steph on December 25, 2006.